First step was to make the run base frame (14x5). Then 1/2 " hardware cloth is fastened to the top side with galvanized poultry staples every 4 ". This frame is flipped over and supported by blocks or whatever so you have access to the now bottom side! 6 three foot 2x4s are fastened from beneath at the corners and in the middle of the long side with screws from beneath. 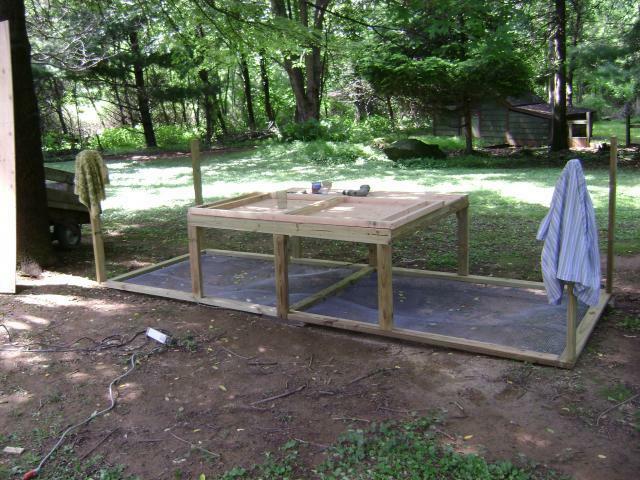 5' X 6' floor frame is constructed and 1/2 "exterior ply is used to deck this. Attach the floor and frame to the uprights or stilts from behind with 2x4 scraps. Screw four uprights (2x4 s) 4 ' long at the runs corners from beneath. "Great Coop, Multiple Articles Difficult to Follow"
This is a single photograph and a few lines of instruction for beginning a coop build. It continues through many more stages, each listed as a separate article. Each step is very good but really hard to use without the context of the other pieces. In order to get good instructions for the full build, or to complete a current phase, the reader has to search for all of the other pieces. Finding them all one step at a time, then putting them in proper sequence, is very tedious and confusing. The details and pictures are good. Together, they would be excellent! Would love to see the finished product! "Would like to see the end product"
The coop looks like it got off to a good start. I like how the run is looking and how it runs under the coop. That will provide some good shade. Make sure that there is sufficient ventilation in the coop.